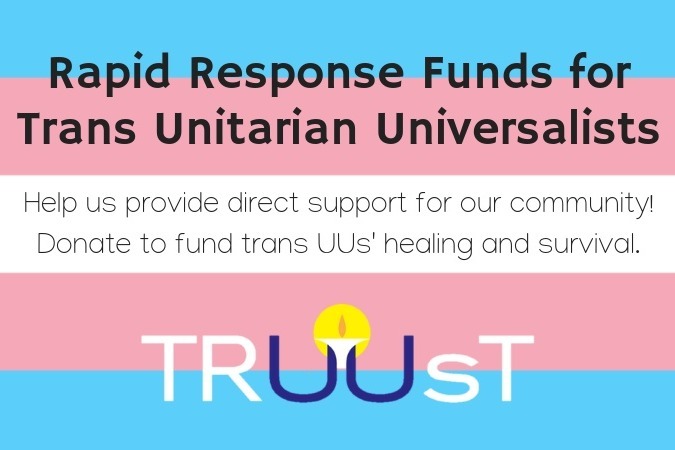 In the wake of recent events and the Trump administration’s continued assault on trans lives, TRUUsT calls on Unitarian Universalists everywhere to take immediate action to live out the above truths and directly support trans UUs by making a donation to fund trans UUs' healing and survival. Half of all trans Unitarian Universalists do not have enough income to meet their personal needs, and in the wake of recent events trans UUs have myriad needs—from needing to escape unsafe living situations to needing additional care and support for PTSD and other intensified traumas. Show your Unitarian Universalist trans kindred that they can depend on their faith community to care for them! Please donate now. Dearest friends, all we can say is thank you. In the last week 141 people have contributed more than $7,000 to this fund, for a total of $12,564 that will be used to support trans UUs in need. THANK YOU. In the last week we've also been able to make a grant to a young black non-binary Unitarian Universalist who is in between jobs and needed help making it to the next paycheck. Because of you, this member of our wider community can pay their bills this week. THANK YOU. Showing up for each other and supporting each other is what faith communities do. Thank you for being there for our people this week, and every week. Six weeks, 85 donors, and more than $5,000 raised to support trans Unitarian Universalists in need. A thousand thanks to each and every person who has contributed to this unprecedented fund. Thanks to you, we've been able to make our first grant to a struggling trans UU, who can breathe easier not only because of being able to make it through the end of the month, but also because of the knowledge that their faith community is there for them. It’s obviously a really challenging time of year for a lot of trans people, particularly those who are isolated and/or don’t have the support/love of their families of origin. So thanks again for your support! Here's hoping that all of our love and care will grow and build into a care- and resistance-filled 2019. We just passed the $3,000 mark, with 50 donations!! Enormous thanks to each and every one of you for giving so generously and asking other people in your life to join you in directly supporting trans Unitarian Universalists in need. This week I provided pastoral care to a disabled trans elder with a degenerative condition who is extremely isolated from community, is on and off suicidal, and is terrified of losing his housing thanks to still being in the process of qualifying for and receiving disability benefits. All of you have made it possible to directly help folks like him stay housed and safe. This is no small thing. It gives me so much hope for UU community and our ability to support those among us who need it most. Please keep sharing this campaign with your friends and folks in your network. Together, we are so strong. Enormous thanks to everyone who has helped us get this campaign off to a great start! Together we've raised more than $1300 in 3 days! With this fund we can support people like Kris*, who is just a few hundred dollars short of being able to pay their seminary tuition for the year. Kris is a multiracial, disabled, non-binary young adult with a call to social justice ministry. Thank you for sending the message to folks like Kris that their faith community supports them and wants them to survive and thrive.